Keeping up with its tradition of celebrating almost everything in a unique style, Delhi University is now set to host a star studded ‘Diwali Mahapuja’ at Polo Grounds, North Campus, claim sources. Some insiders tell us that the puja would be the first of its kind, with no crackers and only ‘sanskars’ lighting up the gathering. 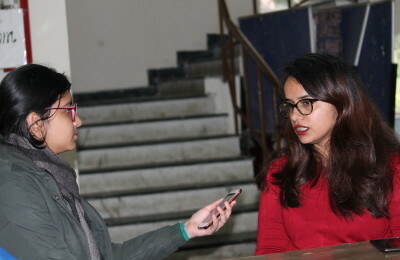 The ‘Mahapuja’ is said to have the tantalising DU effect as star performers like Sunidhi Chauhan and Mika are expected to perform for the students and faculty. Talks are doing the round that the ‘Maha Aarti’ would be commenced by special invitee – Shri Alok Nath. To keep the ethnic ethos in mind, the university, is all geared up to ensure a ‘disciplined and sanskari Indian dress code’ for the evening. Rumour has it that, girls would be allowed to wear either a saree or salwar kameez; shorts, dresses and other western outfits are a complete no. On the other hand, boys are to be clad in kurta pyjamas and other relevant Indian attire. Apparently, Alok Nath ji has consented to be the chief pujari for the majapuja only on the condition that he would have separate puja for girls and boys, claim some petrified sources. As the rumour of the maharaja spread like wildfire, it wasn’t taken in good taste by most students. “This is really foolish. Different puja for girls and boys? What kind of cultural hegemony is this? We study in co-ed colleges and attend India’s top university and we get gender bias? How stupid!” said an infuriated student. A group of girls from JMC, LSR are planning to stage a ‘short- protest’ by wearing shorts during the puja. “This step is anti-feminism. We condemn this abhorrent set of sexist guideline,” said one of the students. Some students are planning to sneak in crackers in the puja to flout rules. Insiders were heard saying that spiritual guru ‘Radhe Maa’ had previously been approached for the puja, however, due to prior commitments she couldn’t give a nod to this event, instead Alok Nath obliged and happily agreed to be the ‘head pujari’ and is looking forward to imparting sanskars and prasad to the students for their exams ahead of the festivities. Disclaimer: Bazinga is DU Beat’s weekly column of almost believable fake news. Bazinga is only a state of mind. Previous PostMaitreyi Launches 'Sociologue' and Talk with Prof. Rajni Palriwala Next PostSEX AMMA: In search of more!